Welcome to the beginning of a new series on VivaLaVidaFM. This series is written by Alex Sneddon, a new author here on our site. He joins South African side Orlando Pirates and will be looking to bring the title back to the Johannesburg-based side in the near future. Over to you, Alex! I have always enjoyed watching African-born footballers playing over the years. Many famous names have played at the very top level of European football. The African continent has produced so many great players such as George Weah (Liberia), Roger Milla (Cameroon), Jay-Jay Okocha (Nigeria), Mustapha Hadji (Morocco) and many more…. The list of names is endless. Most players who play Football Manager opt for European football due to the talented squads and league stature: e.g. English Premiership, Spanish La Liga or maybe the Italian Serie A.
I’ve chosen something a little different, I’m going to manage a football team in Africa. I have no knowledge whatsoever of African football clubs or their leagues so this is a really interesting and unique challenge for me. This will be a long and rocky road, I may have success or it could end up being a disaster! My aim for the season ahead is to bring silverware to the club, I’m sure reaching any of the three finals would please him and the rest of the board. 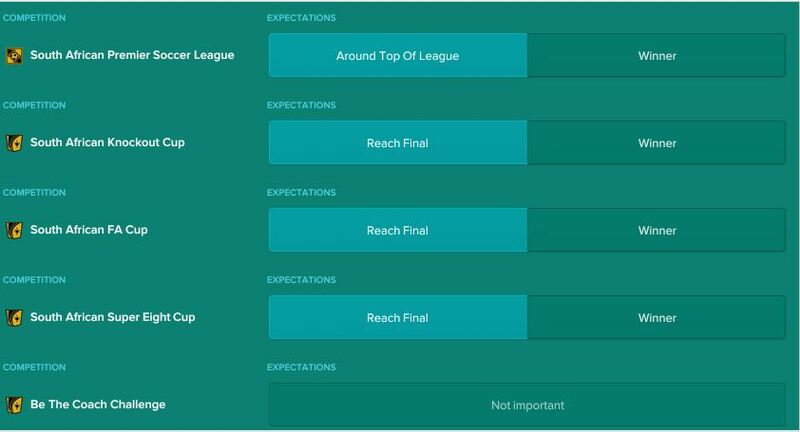 For the league campaign, finish as high as I can. I wouldn’t go as far to say I’ll win the league but I would be more than happy to achieve a top-six finish. After looking over the squad of players at the club, I’m quite impressed with the standard of players and coaching staff. The chairman is wanting success so I’m opting for an attacking formation. I usually like to play with two wing backs supporting two wingers and I’m not really changing it in regards to this team. I’m happy with the current team and feel I don’t need to bring anyone into the squad. I have a transfer budget of £847,476 and a wage budget of £107,575. The youth system is pretty good so I’ll be introducing a few youngsters into the squad during the season. Below is my tactical approach. 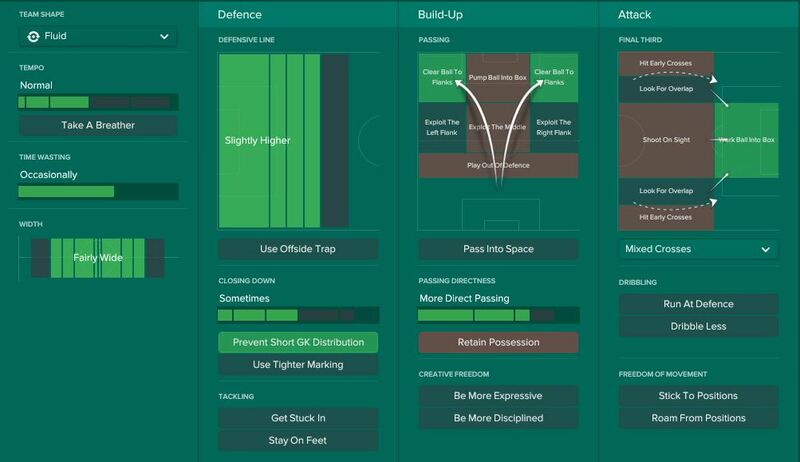 I’ve looked at the attributes of each player and I feel this is the best approach and roles for the players. My wide players are quite pacey so I have instructed them to run with the ball and create chances or even better, grab a few goals. The reason I’m not asking them to play as wingers and make immediate crosses into the box is mostly down to me playing just the one striker. I only have one supporting full-back (on the left) and he’s been noted as an attacking full-back. My right-back has better defensive attributes, however I may change his role at some point if things are not working out. 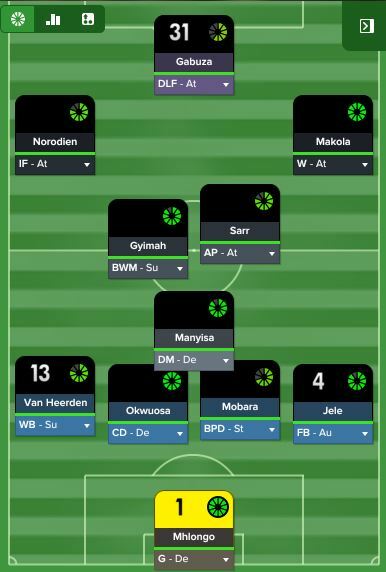 My pre-season training camp is based in Ghana, I’m in the process of organising friendly matches and preparing for the Soweto derby against our bitter rivals Kaiser Chiefs. A one-off game to get some silverware would please our fans. Basically the ‘be the coach’ game is the equivalent of the English Community Shield. I’m expecting a lot of bookings and hopefully goals for the Pirates. Let’s take a look at how we performed in pre-season! We played three games during our time in Ghana. They were all pretty straightforward and there were no shocks. We won all three, scoring 15 goals and conceding 1. The opposition were all amateur sides so it was difficult to access any weaknesses. The positive aspect of the matches was not only the number of goals scored but who scored them. Goals came from all angles and it was good to see them being scored by numerous players. Following our week in Ghana, we returned back to Johannesburg and held a team meeting. The main focus of the meeting was to discuss training regimes and boost morale for the upcoming season. The players left in good spirits after a positive chat and were subsequently given a few days off to spend time with their families. Two more pre-season friendlies were organised against South African 2nd tier sides. Both were won although we struggled against FC Palmeros. Many changes were made prior to kickoff in order to build up first-team game time for our backup players. As mentioned earlier I didn’t look to sign any players. I made a decision to promote two players from my U19’s squad – my plan is to integrate them with first-team players and be tutored by more experienced players. I was impressed with his vision, passing and technical ability. I really see something in this young lad, with the correct mentoring and some first-team experience he could have a really good future. Definitely one to keep a close eye on. This young lad could be another future star, but only if he trains hard and keeps a level head. I have listed him for loan as I feel first-team experience at another club may help him as a footballer and potentially become a first team player for us. I decided to sell Nigerian youngster Emmanuel Daniel. Emmanuel became homesick which is understandable at his age. After a formal meeting with him and his agent, it became apparent that a move was on the cards. We discussed alternative options such as a loan move to a Nigerian club but Emmanuel was adamant for a return to Nigeria on a permanent basis. His agent found him a club in Nigeria and I would not prevent anyone from leaving who wishes to go, especially a 22-year-old comes first before football. I wish him all the best for the future. Twelve players have been sent out on loan, I feel they would benefit from first-team experience and it’s always good to keep their morale high. All but one are playing in South Africa. Itumenleng Tlalli decided to have a spell at Sudanese club Al Hilal Omdurman. I have instructed my staff to keep a watchful eye over all of them and decide if they are worth keeping or letting them go elsewhere to develop their career. The South African Football Association are very strict when it comes to non-South Africans in a squad. The maximum allowed in any squad is five. The Orlando Pirates squad currently has four. Seven substitutions can be named with a maximum of three used. I will be looking very closely at our reserves and U19’s team throughout the season. Our team has two feeder clubs in which players from our club can be loaned out in order to gain first-team football. Both clubs are in a lower league, so maybe during the season some players can see be sent for first-team football. Although, it looks unlikely that will ever happen. The chairman was approached by myself and asked about adding a senior affiliated club into the ranks. Unfortunately, the chairman dismissed the proposal as he preferred the club to remain independent. I was disappointed with the response, however more pressing matters to get on with. Time to finally get the season underway and get some early results on the board. Thanks for reading Part One of a new Football Manager story by Alex Sneddon, a new author here on VivaLaVidaFM. If you enjoyed this post, be sure to give it a like and leave your feedback in the comments section below. This entry was posted in FM17 Stories, FM17 | Los Piratas, Football Manager 2017 and tagged fm stories, fm17, football manager, orlando pirates, south africa. Bookmark the permalink.